This is Lomondhills Easter Surprise who we affectionately know as Angus! He was born on April 2nd, and is the pick of our recent litter from Amber and Marley. 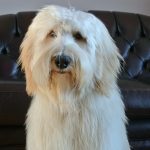 He is not going to work for our programme, so we are making him available for another breeder. He is standard size, expected to reach 23" at the shoulder and around 24kg. He has a lovely soft gold loose fleece coat and both his grandfathers are red. He is a very chunky, stocky boy, very well put together with beautiful movement. Angus is a confident, laid back chap with a playful sparkle. He is very sweet and outgoing and loves following us around! 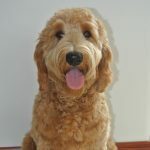 Angus comes from a combination of traditional and new Australian Labradoodle lineage, so will be a great asset to breeders looking for new blood. We are in the UK and are happy to work with approved overseas breeders. Please contact us if you are interested in adding Angus to your programme.